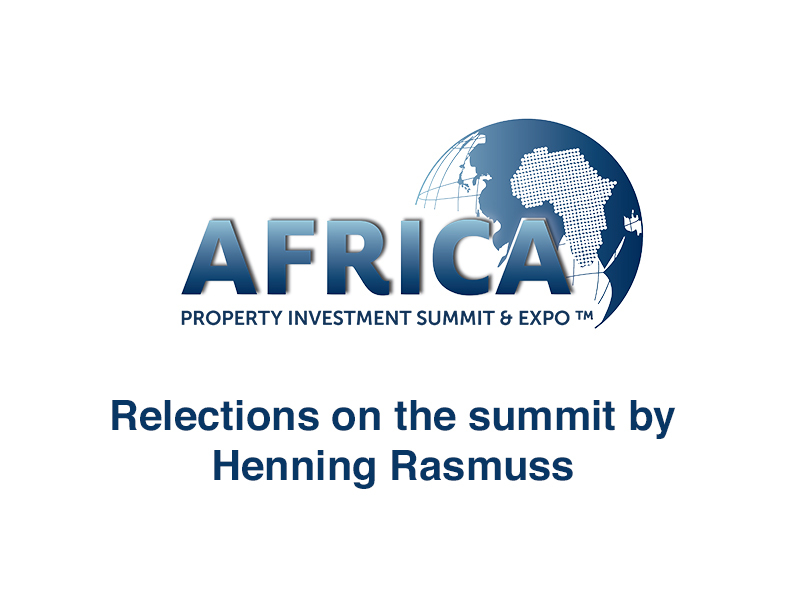 Our director Henning Rasmuss attended the 9th African Property Investment Summit in Sandton last week. The audience was diverse, if smaller than expected, and the discussions and presentations were honest and muted. There was a fair degree of introspection. New connections were made, and old friendships strengthened. Mauritius is emerging as a property investment talking point, and we are already looking at projects in that country. With the pervasive underperformance of the South African economy, continental Africa remains attractive, even if it is difficult and takes immense patience. There were stories of both failures and successes, and some very fine people have had their spirits and their businesses tested to extremes in the recent past. Noteworthy talking points were: the role and reach of local in-country Pension Funds, the growth of South African listed investment funds, GRIT’s listing on the LSE, and asset classes such as Logistics Parks, Student Housing and Affordable Housing. There was at last an informed discussion on what the ‘affordable’ part of ‘affordable housing’ actually means in different economies. With the Oil Price returning to levels where African countries see the ‘easy money’ of extractive industries once more, there is a return to some confidence. Paragon Architects, for example, is receiving up to 12 enquires per month from the continent. This is however in contrast to the approximately 35 enquiries per month we received in 2015, just after the global oil price crash. However, extractive economies cannot create enough employment for the much-vaunted Youth Population of the African continent. The continent has to industrialise and beneficiate its natural assets, and this requires intra-African investment and focus. China continues to seduce African governments with deals and projects that appear to be good deals, but whose real price tags are not measured in dollars or yuan, but in future political control and voting support for China in global geopolitics. ‘Recolonization’ is not quite the right word for what is happening on the continent. It is more like low-price subscription to future economic enslavement, and South Africa is seeing its first wave of Chinese incursion into our construction landscape, in the context of endemic failure of South African contracting businesses. Paragon Architects is gravely concerned about which companies will be around to construct our South African large projects, in a few years’ time.